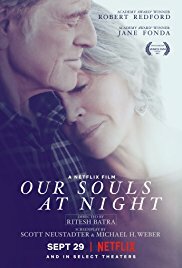 The beauty about Netflix becoming a movie distributor is that you get all sorts of original films that go straight to the streaming service for subscribers to watch, and there’s literally something for everyone including horror fans, children, teenagers and now, with the release of Our Souls At Night onto their catalogue, grandparents who are just happy that anything is playing on their television at home which saves them from sitting in total silence. I am not the target audience for this film, which comes from us from director Ritesh Batra – who also made this year’s earlier forgettable drama The Sense of an Ending – and headlining co-stars Robert Redford and Jane Fonda, in their first on-screen appearance together since 1979’s The Electric Horseman, and exactly fifty years since their most famous pairing Barefoot in the Park, so I feel there’s not a whole lot to say about it from my perspective. I thought it was completely serviceable and definitely bolstered by Redford and Fonda together, but overall it was a film that just came and went for me, leaving not that large of an impression on me. Things kick off when Addie (Fonda) knocks on the door of her quiet next-door neighbour Louis (Redford), and asks if he wouldn’t mind sleeping with her – in the literal sense, that is, as a platonic gesture to help her fill the void left by her late husband. Louis, a widow himself, soon agrees to this bizarre proposal, and soon they start bonding with one another as he helps her look after her grandson Jamie (Iain Armitage), leading to a real romance blooming between the two. As far as plots go, it is definitely very light on its feet; the main focus is just on these two people coming together to form a strong connection, and letting natural events be their biggest threat instead of other sources like a former boyfriend or girlfriend, or something like that. As they talk, of which there is a lot in this film, you learn a bit more about them as individuals, and what past experiences they had that had left them pretty emotionally broken, such as a brief affair with another woman or losing a child when they were very young. Nothing about it demands any kind of weight, as that just simply isn’t what this movie wants its audience to do, but Redford and Fonda deliver it all so well and you can tell that there is some genuine affection between them whenever they do end up bonding, that you feel everything that comes out of their mouth to be truly gripping even when they’re just talking about the most mundane things. Because of its gentler appeal, there are times when the movie will grind to a snail’s pace, causing it to lull in places and leave you wondering when the next notable event is going to occur. Thank goodness this movie is on Netflix, which means I could check my phone every now and then, and not have it be a nuisance to anyone else who may be watching (which there wasn’t, by the way… I am so alone), but the parts where I was paying attention were completely serviceable and gentle entertainment, and again Redford and Fonda are so great together that you’re really rooting for them to end up together from the moment they begin opening themselves up to each other. There were a few other elements that didn’t really work, like Matthias Schoenaerts occasionally showing up as Addie’s temperamental adult son who is probably the closest this film gets to having a real villain, if only because of his hostile and dickish behaviour towards Louis, and once again Judy Greer is completely wasted in a role that really could have been developed a whole lot more if she was there for more than one scene (seriously, why does Hollywood not have anything good for Judy Greer to play anymore? Hopefully her recent casting in the Halloween reboot can give her something with a bit more meat to it, because she is a really strong talent that’s somehow still waiting to fully branch out). Like I said, there’s not a whole lot that I can really say about this film. It’s one where I am most certainly not the target audience for, and definitely appeals to people who have a few more years on them than I do. But that doesn’t mean I discard it entirely; for what it was, I thought it was completely harmless fluff that does exactly what it set out to do, and then just exists as an option on a streaming service which I would never choose again, but am glad I saw at least the once. Our Souls At Night is harmless fluff that uses the natural on-screen chemistry between Robert Redford and Jane Fonda to its advantage, but otherwise is just like your aging grandparent: sweet, but forgetful.